A few weeks back, I wrote about a game mechanism that I really like - Programmed Action. Today, I'm going to do that again, for a different mechanism. Today, I'm going to discuss trick-taking games. I'd say that all trick-taking games are card games, but someone somewhere would pop up with a game that breaks that mold. I will say that all trick-taking games that I know of are card games. And all of them have at least a little bit of strategy to them. In a trick-taking game, players throw one (or more) cards into the middle of the table, and other players play additional cards into the center of the table usually in an attempt to beat the exist card(s) and win the cards which have been played. Some games feature a trump suit that automatically beats other cards of different suits. Honestly, when I encountered someone who wasn't familiar with trick-taking a few years ago, I was stunned. It's extremely common, and there are _thousands_ of games that feature it. Many of these games use a standard Poker deck, so it's cheap to get started. In fact, you probably have a deck somewhere in your home. I first encountered Hearts not with my family (like so many kids do), but with friends. And then I re-discovered it when it was pre-installed on Windows '95. It requires a standard poker deck, and players throw one card per trick. The goal is to avoid taking cards of a certain suit (Hearts), and avoid another specific card (the Queen of Spades). Each trick is one card per player, and players must follow suit whenever possible. If you cannot follow suit, you can throw anything. There is no trump suit.The game ends when someone reaches 100 points, and the lowest score wins. This is - for me - a relatively new one. I know it's hugely popular, but it's just not one we played in our house. Probably because it's a partnership game, and we had an odd number of players. Each hand starts with a round of bidding - players bid how many tricks they will be able to win that hand. Spades are always a trump suit, and you must follow suit if able. If you cannot follow suit, you can throw anything. Each trick is one card per player. If you fail to meet your bid, you lose points equal to ten times your bid. If your team meet your bid exactly, you score ten times your bid. If you take more tricks than you bid, you score ten times your bid plus one point per additional trick taken. If, as a team, you ever take a total of ten extra points, your team loses 100 points. You can bid "nil," which means you won't take any tricks that hand. If you succeed, you score 100 points for your team. If you fail, you lose 100 points for your team. There are a number of variant rules for this one, including "Blind Nil," bids, which are worth 200 points but which must be made before you look at your hand. Some variants allow partners to pass a card back and forth. The game itself is pretty standard. Certain cards are "counters," and one card is played per trick. Players must follow suit if possible, and may play trumps if they cannot follow suit. Like many partnership games, it starts with a bid, and the bid winner gets to choose the trump suit. There are a ton of variants. I actually grew up playing a variant that isn't on that page. The wrinkles that Rook brings to the table are the Nest and the Rook card itself. When dealing the cards out, there is a separate pool of five cards that is created. The player who wins the bid picks those cards up and then lays down five more cards. Each trick is one card per player, and you must follow suit if possible. Whoever wins the last trick gets to take those five cards for scoring - it may be nothing, but I've seen valuable nests. The Rook itself is usually the highest trump card, regardless of suit. Some variants (including the one I grew up on) features the Rook as the lowest trump card. At the end of the trick, the bid-winning team checks to see if they made their bid (or more). If they did, they score what they took. If they didn't, they go negative by their bid. The other team just scores what they took. Pinochle is the game I played the most with my family. It's another single-card trick-taking partnership game, but it requires a special deck of 48 cards. There are tons of regional variations (for some reason, double-deck Pinochle is the most commonly found online). The team that wins the bid gets to pick the trump suit. The unique feature of Pinochle is the meld. After bidding, but before players start taking tricks, certain combinations of cards are worth points. So a King and a Queen, for example, is a Marriage. "Kings Around" means you have a king in each suit. You can also have runs (9-J-Q-K-10-A) in the trump suit. Some variants have runs as Jack through Ace (and note that 10 is between the King and the Ace in this one), with bonus points for the nine of trump. The "Pinochle" is a Jack of Diamonds and a Queen of Spades. And it's possible to have doubles of most of these, as there are two of each card in the deck. Another unique feature is that you must play to win each trick, with a few exceptions. Tricks are single cards, and you must follow suit. If you cannot follow suit, you must throw Trump (if possible). So if you throw a Queen of Spades to lead, I must throw a King, Ten, or Ace of Spades if I have them. If I don't have them, I can throw any Spade. If I don't have any Spades, then I must throw a trump card. If I throw trump, the next player must play Spades if possible (but my trump means they can throw any Spade because now I'm winning the trick). If they can't throw a Spade, then they have to throw trump, but it has to be a higher trump card than what I played (if they can). If they can't beat my play, then they can play anything in the trump suit. If they're out of both Spades and the trump suit, they can throw anything. The first Days of Wonder game I ever bought was Gang of Four. And not this second edition, either. I bought it before I knew what I was doing. It was ... not bad. It's the first trick-taking game I had played where players could play more than one card to a trick. By "more than one card," I mean both "can play sets instead of singles" and "the trick keeps going until all players except one pass." I still really like this one. No bidding in this one, just play. Before playing, however, you'll pass cards to other players, and then the cards themselves determine who plays first. Scoring is based on the number of cards people have in hand when one player runs out. Tichu is the highest-rated trick-taking game on BoardGameGeek. It's almost in the Top 100. At the time I write this, it's #103 overall. It has a lot in common with Gang of Four - it's a trick-taking game where you can throw sets of cards, and not everyone needs to play every trick. In fact, there will be times where you can't play. Tichu has a different set of special cards that do different things. And it's a partnership-based game. The goal is to run out of cards before your opponents do, and the special cards include one card that passes control of play to your partner. After the deal, you'll pass one card to each other player. Players also can call "Tichu" at two times - one is after only part of the hand has been dealt. This is a "Grand Tichu" and is worth a lot of points. The other "Tichu" call is before you play your first card, and it's worth a smaller number of points. If you fail to go out first after calling Tichu, you lose points equal to what you would have gained from that Tichu. And Tichu also has a card combination that is called a bomb, which you can play at any time - even out of turn. Haggis reminds me a great deal of Tichu and Gang of Four, only this game is optimized for 3 players. There are vanishingly few games that are good with three, so this deserves special mention in that respect. It also gives each player three wild cards at the beginning of the hand that are worth points if they're not used. Each trick is a set of cards, and you must beat the existing set to play. Or you can bomb it. Haggis starts with a bidding round, but unlike most games with bidding involved, failure to make your bid doesn't cost you points - it gives points to your opponents. It means that a game if Haggis is always moving forward. Unlike the other games on this list, every hand advances someone towards the in. It's possible for a game of Pinochle to last a crazy-long time because players fail to make bid and slide backwards. In Spades, you can bid 'nil' and then take a trick causing you to slide backwards. In Haggis, an error like that that just increases your opponents' scores, driving the game forwards towards its end. Have you ever played Powerboats? If not, you're really missing out. It's become a favorite over the years, and I don't play it as much as I'd like to these days. I say that about a lot of games. Well somewhere along the way, Powerboats went out of print. You can still find it for a reasonable price on the BoardGameGeek marketplace. So let me explain Powerboats to you - it's fast. I promise. Add a (three-sided) die. You then roll it and add it to your speed. Remove a die. Choose any of your current speed dice and pull it off of the display. Re-roll some or all of your current speed dice. Note that even if you add or remove a die, you can still re-roll some (or all) of your current speed dice. Once you've adjusted your speed, you then need to move. You can turn one hex side to the left or right, or you can go straight. Once you've got that all adjusted, you then move in a straight line. If you hit an island, you take damage. If you take four points of damage, you sink. It's a racing game, and you're trying to race around three buoys (that word always looks wrong to me) and then back to the starting line, and you score points based on the number of people you beat. 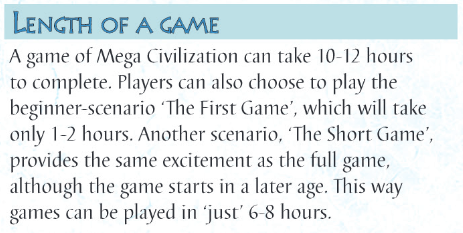 Ideally, each session involves three races. Race two is worth double points, and race three is worth triple points. After three races, the player with the most points wins. The game really is that simple. There's an expansion that adds some variation to the basic game. Hexes that push you in one direction or another, jumps that let fast-moving boats jump over islands.Whirlpools that spin your boat. As I mentioned above - it's gone out of print. I honestly don't know if it even had a second printing. But Cwali doesn't tend to do large print runs, and many of their games command crazy-high prices once they actually start to attract attention. Well, Cwali had decided that he enjoyed Powerboats enough to dig the design out again and tweak it. The result is now on Kickstarter with just over a week to go. If you liked Powerboats, you'll almost certainly like Powerships. If you haven't played Powerboats, the rulebook for Powerships is linked to on the project page. He stated on BoardGameGeek that the final print run will be Kickstarter Demand plus about 20%, so it's not a game you're likely to stumble across at your FLGS. I try not to sell too many Kickstarters at folks here. I'm a games blog, not a PR or marketing blog. And Kickstarter has been very disruptive for the local game stores that I honestly believe should be at the heart of our community. I get a dozen or so e-mail requests every week from folks to advertise their projects here. And I've never done it at their request. There was one project that I had scheduled my post before I received the request, so I let that one slide. Cwali did not contact me to request this post. Let's be brutally honest, here: I'm a small fish in the gaming blog world. But I'm still doing what I can for this project, because I want it, and it's not going to happen without your help. This post is going live two days before Hugo nominations closes. I'm not going to tell you all of who I voted for, but I want to spotlight a few works that I was especially fond of this year, and that I doubt will be on the final ballot. There's a ton of overlap between SF/F readers and gamers, so I hope you'll forgive me this side-trip out of gaming for a week. I don't like baseball. I think it's a dull sport that is not really worth the time spent watching it. This is largely because of a lack of strategy inherent in the game itself. Yes, there is some, but much of it is set before the game even begins and isn't particularly flexible after the game starts. But if you strip the game itself out, sometimes baseball can be amazing. Transcendent, even. Shoeless Joe is one of W.P. Kinsella's three baseball-related novels (The Thrill of the Grass and The Iowa Baseball Confederacy are the other two). All three blend subtle fantasy with the baseball itself, and they're a joy and a delight to read. All three of them make me wish I liked baseball. And none of them are shelved in the Fantasy section of bookstores. None of them are eligible this year, either. Kinsella was one of the authors who passed in 2016. But Harry Turtledove, whose books always wind up in the SF/F section of bookstores, did have a baseball book drop this year. The House of Daniel was fantastic. Much like Kinsella's books, it made me wish I liked baseball. And it highlighted just enough baseball strategy that the game itself is slightly less boring for me. Slightly. I still won't sit through a game, given a choice. But it was good enough that it's on my Hugo ballot. Person of Interest was initially a "guilty pleasure" show for me. The first season was - like many TV shows - a series of (mostly) unconnected stories in which the main protagonists had to get to the bottom of a mystery provided to them by a computer. As the show went on, the SF elements spun ever higher until the last few seasons were all about a clash between two artificial intelligences. It's worth getting through the first season to get to the other seasons, and the last four episodes are four of the best hours of television that I have ever watched. Since the last few seasons were a cohesive story, I nominated it in the Long Form category. I also nominated a few specific episodes in the Short Form category, because - again - they were fantastic. It's on Netflix here in the US. This year, WorldCon is test-driving a "Best Series" Hugo award. There are a ton of series that are worth voting for, but The Craft Sequence series by Max Gladsone really grabbed me this year. The fifth book, Four Roads Cross is its "qualifying volume." I've ranted about this series before in a variety of places (mostly on social media), but it's very much worth a read. Book one is Three Parts Dead - and I warn everyone that it's a bit of a slow starter, but it gets better and better and better the deeper into it you go. The other four volumes either don't start as slowly or else I just didn't notice because I was already invested in the world. I got to play Mega Civilization again a few weeks ago. 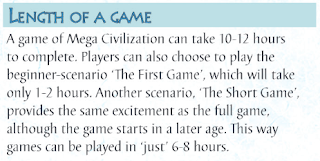 A full eighteen-player game, even. Several of my friends on Plus had asked me to let them know how it went and tell them what I thought of the game. I figured it'd be waaaaaay too long to be a good social media post (not that I've been stopped by that before, mind you), so I'm writing about it here. Let me start with an overview of the game. This will probably run a bit long. ... just like the game. In fact, buckle up. This is going to be a crazy-long post.